The F2T Box launched during the first weekend of February. The F2T Box is a weekly grocery delivery, supplying local food from over 50 farms throughout the Hudson Valley—such as Roxbury Farm, North Wind Farm, Mead Orchards, Turkana Farm, Hawthorne Valley Farm, Bulich Mushroom Farm, and many others. 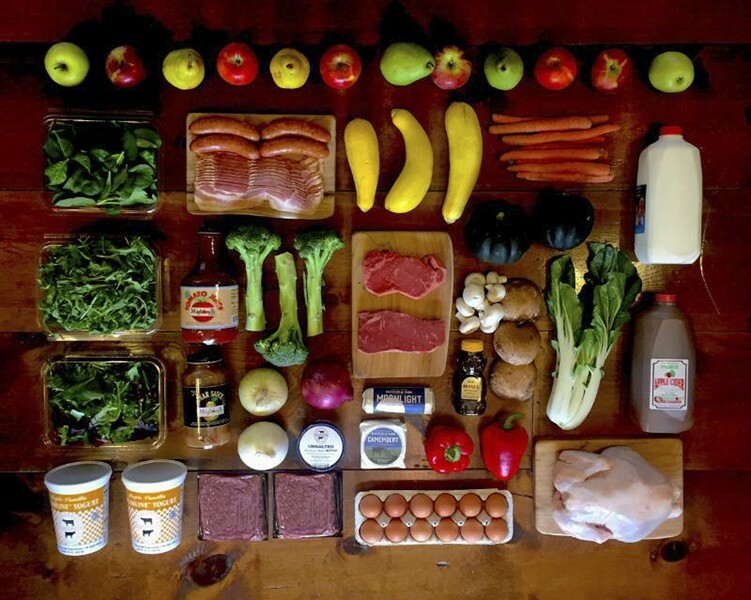 The boxes supply weekly groceries that are fresh, local, and convenient. They come in three different sizes, and each box consists of a variety of local vegetables, fruits, salad greens, cheeses, yogurt, milk, eggs, and meat. Additional value items are also included. Vegetarian and no red meat options are available. The F2T Box is the sister company to the wholesale distribution company Farms2Tables. The company began in June 2015 and is expanding their service outreach this spring. Their current distribution reaches from Saratoga to Manhattan. Together with their fleet of trucks and connections with Hudson Valley farmers, Patricia Wind and her business partner Clifford Platt decided to take the next step from wholesale distribution and create a project that reaches the retail consumer level. The F2T Box was inspired by customers who desired easy access to fresh, local food. The boxes are intended to be the consumer’s weekly source of groceries. The estimated cost is between $4.95-$6.25 per meal, compared to the $8.95 cost of other subscription plans. They plan the contents of the boxes a few days before distribution, checking in with each farm to see what produce is available. If there is a surplus at a farm, the product is included in the box for that week. After the contents have been decided, the information is passed along to local chefs in the area, who then write recipes specific to the items in the boxes. The recipes are posted on the F2T Box website for subscribers to use as a reference when they receive their boxes. The company collects the produce from the farms prior to the weekend, and then the boxes are assembled on Saturday at their site in Rhinebeck. On Sunday morning, the boxes go to selected pick-up locations throughout the Hudson Valley region—in places like Albany, Red Hook, Hudson, Rhinebeck, Poughkeepsie, and Tivoli. Farms2Tables is open to new businesses interested in hosting a pick-up location for at least three hours on Sundays. The company also offers a delivery service every Monday to businesses who have at least five subscribers. Below are two recipes created by Rei Peraza of Panzur Restaurant in Tivoli. Duck: Score the skin about halfway through. Season aggressively with salt and pepper and allow to rest at room temperature for 20 minutes. *Kohlrabi—peel and julienne thin strips. *Roasted salted peanuts—lightly crush with the back of a knife or pulse in a food processor. *Pat dry. Place the skin side down in a cold pan and turn on to medium-low heat, allowing fat to slowly render. As it does, turn flame a bit higher to crisp the skin. After the skin is a dark golden brown, remove the fat from the pan and add the glaze. *Flip the breast and remove the pan from the heat for three to five minutes. Then, remove the breast from the pan, allowing it to rest for an additional eight to ten minutes before slicing. *Toss all ingredients together, season with salt and pepper. Chicken: Don’t wash the chicken, just pat it dry. Spread the herb butter in between the flesh and skin, gently so the skin does not rip. Add a split head of garlic, a few slices of lemon, and a handful of thyme sprigs into the cavity. Combine parsnips and apples. Cover with cream, and cook gently until tender. Mash and season with salt and pepper. Cover and keep warm. *Cut bacon into lardons, render slowly. Remove the bacon when it is crisp. *Slice the onions and mushrooms and add to rendered bacon fat. When onions and mushrooms have cooked down, add thyme leaves and chicken stock. Cook down until it has thickened slightly—season and keep warm. *Pre-heat oven to 350 degrees. *Liberally season the chicken and place the breast side facing up on a roasting rack. Cook uncovered for approximately one hour and 15 minutes. *Allow to rest for 25-30 minutes before slicing. The juices from the thigh should run clear.